George C. Orlando, 91, of Hillside, NJ passed away January 29, 2017. A mass of Christian burial will take place on Wednesday, February 1, 2017 at Christ of King Church, 411 Rutgers Street, Hillside, NJ at 10am. The family will receive their friends at McCracken Funeral Home, 1500 Morris Ave, Union, NJ; on Tuesday, January 31, 2017 from 4-8pm. Born in Newark, George moved to Hillside in 1959. 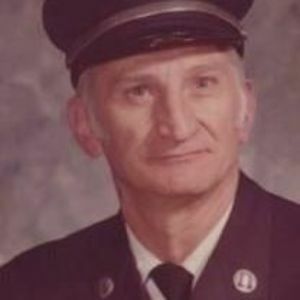 As career firefighter, he was a rank captain and spent most of his career at Engine Company 10. He was with the department for 34 years. As a veteran of WWII, he obtained the rank of Staff Sergeant while serving in the European Theater. George is also a member of the FMBA, Newark Fire Officers, Fireman’s post 1851 VFW the NJ Exempt Fireman’s Assoc and the Elks Lodge 1583 in Union. After retirement George divided his time between Hillside, NJ and Boca Raton, FL. Beloved husband of 69 years to Marion (nee Monaco). Devoted father to George J. and his wife Karen, Linda and her husband Joseph DeCosta. Adoring grandfather to Christina DeCosta and Joseph and Nicholas Orlando. In Lieu of flowers donations may be made to Homeside Hospice, 67 Walnut Ave., Suite 205, Clark, NJ 07066. 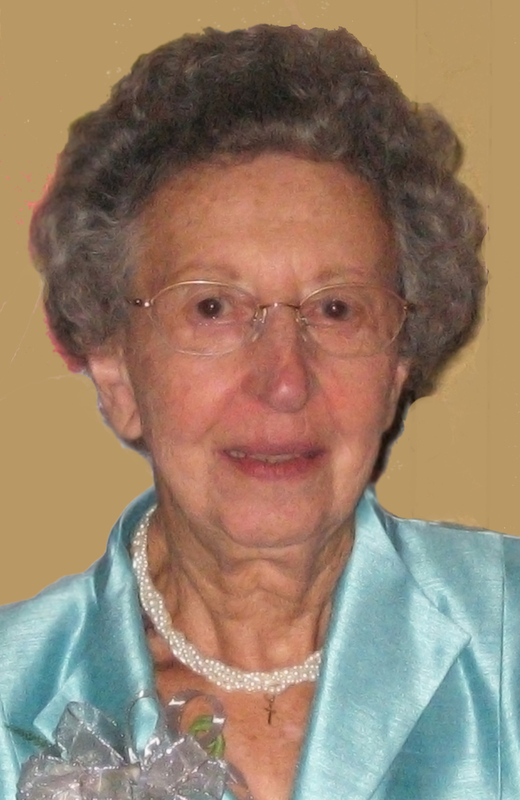 Grace O. RAUSCHER (nee Orlando) January 6, 2017, age 94, beloved wife of the late Robert W. Rauscher; devoted mother of Barbara Rauscher, Joseph (Mary) Rauscher and James (Kathleen) Rauscher; loving grandmother of seven grandchildren and four greatgrandchildren; dear sister of George Orlando and the late Mildred Piccioli, Marie Cameron, Helen Gohr, Frances Parrino and Joseph Orlando; also survived by many nieces and nephews. No prior visitation. Prayers will be said on Tuesday morning at 8:45 AM at the Urban Amigone Funeral Home (http://www.amigone.com/) 3645 Genesee St. followed by a Mass of Christian Burial celebrated from the Chapel of Our Lady Help of Christians Church at 9:30 AM. Family and friends invited. In lieu of flowers, memorials may be made to the Carmelite Monastery, 75 Carmel Rd., Buffalo, NY 14214. 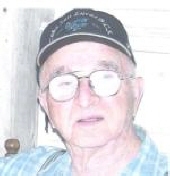 Louis Orlando age 91, Porterfield resident died Sat. He was born to the late Little Tony and Pauline Orlando in Crivitz, November 21, 1919. He married Evangeline (Angie) Wiedemeier on October 19, 1940. They worked Through out Wisconsin Building Distribution Power Lines. During the winter months he was a butcher. Louis bulldozed with his brother Richard, truck driver hauling pulp wood in Michigan. In 1948 Louis started Orlando Construction. He worked in North & South Dakota for government building H frames lines. After retiring at the age of 70 he once again stared his own business selling tools until age 88. Louis enjoyed time with his family. Relaxing at home watching T.V. going out to eat with family & friends. The couple celebrated their “70th” Wedding Anniversary at Trade Winds with Family & Friends October 19, 2010. Beloved husband of Angie, loving father of Janice (John) Netzel of Crivitz and Diann (Mike) Martin of Palmyra, WI. Grandfather of two extra special grandchildren Tina(Leonard) Lutzow of Wausaukee, Steve Wiedemeier of Crivitz also Jason (Candy) Martin League, TX and Todd Martin Palmyra, WI. Great-Grandfather of 6, Great-Great Grandfather of 4. Special Friends Alvin (Bee) Wiedemeier and Tom (Joann) Bemis of Crivitz. Friends may call at the Rhodes-Charapata Funeral Home in Crivitz January 27, Thursday from 11a.m. until time of Funeral at 2p.m. Rev. Walter Stumpf officiating burial in St. Mary’s Cemetery. The entries are in Latin and will need to be translated to Sicilian as identified below. Any differences in spelling is due to how the name appears in the sentence of the record. The babies were all baptised the same day as they were born. 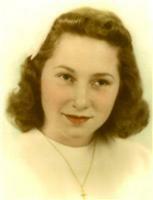 Josephine Orlando 93, Crivitz, currently Renaissance Assisted Living, Marinette passed away Friday, May 25, 2012. Josephine was born Oct. 3, 1918 in Crivitz to the late Anthony and Mary Orlando. Josephine lived and worked in California for 35 years. Upon retiring she moved back to Wisconsin and settled in Green Bay where she had many wonderful friends. Survivors include 6 brothers Leonard (Myra), Carl (Pat), Ralph (Pat), John (Marie), all of Crivitz, Louie (Lil), Franksville, Paul (Virginia) of New Franken, 2 sisters Stella (Al) Frontczak, Brookfield, Annie Katers, Green Bay, and sister-in-law Mrs. Arthur (Viola) Orlando. She was preceded in death by a brother Arthur, and a sister Helen Alpern. Friends may call at Rhodes-Charapata Funeral Home, Crivitz form 10-12 Noon Tuesday. Funeral Service 12 Noon at the Funeral Home with Luther Raine officiating. Burial will follow at Forest Home Cemetery, Crivitz. 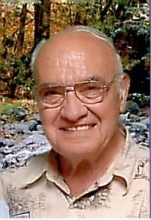 John B. Orlando age 86, Crivitz resident passed away March 31, 2014 at V.A. Hospital in Iron Mountain, MI. He is survived by his wife Marie and three daughters Linda (Don) Netzel of Crivitz, Bonnie (Steve) Kartheiser of Fond du Lac, and Sue (Dave) Cosentino of Athelstane, also daugthter-in-law Patti Orlando of Appleton and many grandchildren and great-grandchildren, two sisters Anne Katers and Stella Frontczak also three brothers Carl (Pat), Ralph (Pat) and Paul (Virginia) Orlando also sisters-in-laws, Vi Orlando, Lillian Orlando and Myra Orlando. Preceded in death by his parents, wife Sharon, son John Jr. three brothers Art, Louis and Leonard and two sisters Josephine and Helen also three brothers-in-laws Walter Alpern, Al Frontczak and Orville Katers. Friends may call at the Rhodes-Charapata Funeral Home in Crivitz Friday April 4, 2014 from 8:30 a.m. until time of funeral service at 11 a.m. Officiating Luther Raine, Erwin Hoest and Eric Nueske. Interment will be in Forest Home Cemetery in Athelstane. 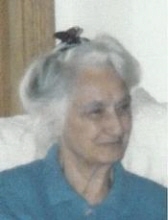 Albina Jane (Orlando) Logan, 88, of Pawcatuck, passed away June 10, 2015. She was affectionately referred to as Ma Logan and Gramma Bean. Albina was the daughter of the late Anthony and Victoria Orlando, formerly of Stonington. She is survived by her 7 children: Robert, Kevin, Terrence (Debby), Patricia, Linda, Sandra (Santo Algiere), and Christine Logan; also her grandchildren, Michael, Andrew, Kennedy, Seth and Army Sgt. 1st Class Emily Logan, Melissa Morenzoni (Scott) and Lindsay Fair (Matt) and 9 great-grandchildren. Albina was predeceased by her son, Michael, grandson, Peter, brother, Maurice Orlando and her former husband, Robert Logan. Albina worked as a secretary at Stonington High School shortly after graduating. While raising eight children, she played a supporting role in the early development of Ortronics Inc. where she worked alongside her brother, Maurice Orlando. She then went on to be a bookkeeper in various Summit Nursing Homes until her retirement. A lifelong resident of the area, Albina was a charter member of the Rhode Island Beach Buggy Association now known as RIMS. It was not uncommon for her to pile her kids in the back of the beach buggy and fish the night away. Another of her great loves was walking the shores of Charlestown Pond with her good friend Mary Hines. Cigarettes tucked in the top of their bathing suits and a bushel basket in tow to hold the crabs they would catch. Later they would stay up until the wee hours of the morning feasting on the fruits of their labor. Albina spent many years cheering on her children and grandchildren in their various sporting events at the Pawcatuck Little League Field and other local athletic venues. She often displayed her talents of singing and dancing in the local minstrel shows benefitting the Pawcatuck Little League. Always the Renaissance woman, Albina invested much time researching holistic practices often mesmerizing her doctors with her knowledge of alternative medicines. She instilled in her children an entrepreneurial spirit that continues on in them today. She enjoyed playing the slots and was an avid Red Sox, UCONN and New England Patriots fan to the end. A kind and caring person, she will be greatly missed by all that knew her. The family would like thank Sandra Logan, who greatly extended Albina’s quality and length of life through her selfless, unending attention to their mother’s care. 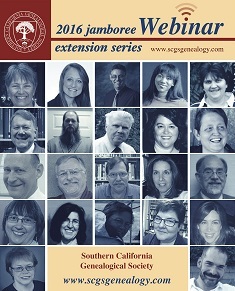 In December the Southern California Genealogical Society released t heir 2016 Webinar series schedule. There are some familiar faces scheduled and in many instances I need to go to bed very late if I am to hear the webinars! – there is an eight-hour time difference between Pacific time and GMT. My buddy Tessa Keough is scheduled for 17 August 2016 with What’s in a Name? 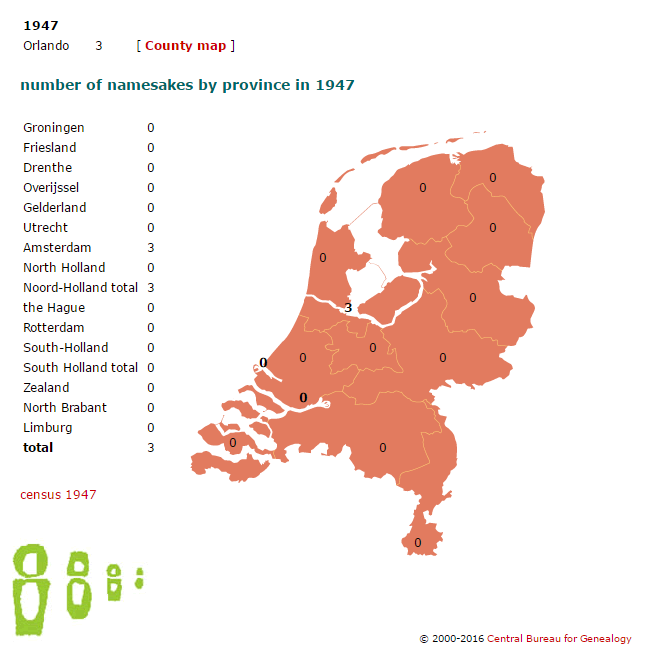 Every Surname tells a Story. Despite Tessa and I being buddies, we knew each of us had submitted proposal, but didn’t know what! They are though very different presentations and I hope some of you will join us! 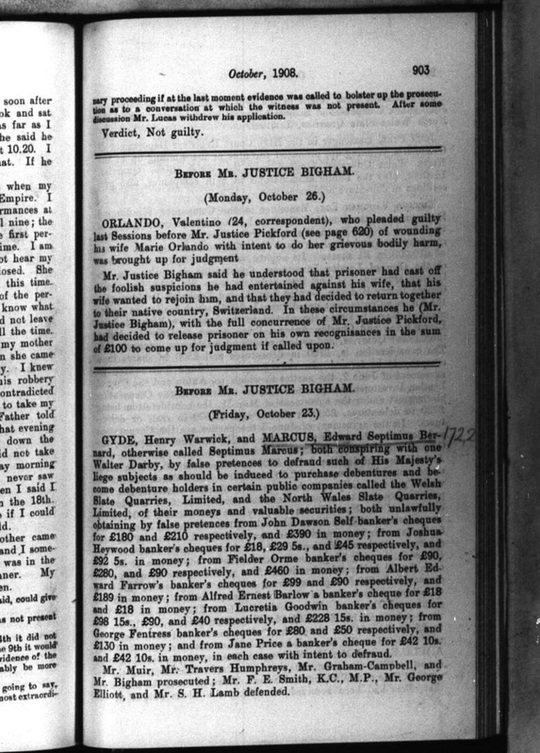 Mr. Justice Bigham said he understood that prisoner had cast off the foolish suspicions he had entertained against his wife, that his wife wanted to rejoin him, and that they had decided to return together to their native country, Switzerland. 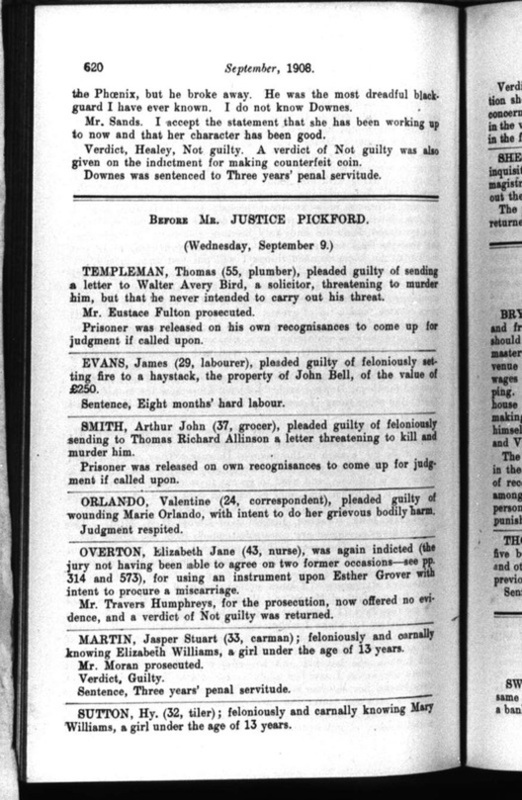 In these circumstances he (Mr. Justice Bigham), with the full concurrence of Mr. Justice Pickford, had decided to release prisoner on his own recognisances in the sum of £100 to come up for judgment if called upon. The Orlando Study website first went online on 15 February 2002 and was moved to its previous site in 2013. The Orlando blog went online in 2006. The counter at the original blog was at 13,582. In late December 2015 I merged the two sites into this platform & the counter was reset.